A fractured tetrahedron produces 4 more tetrahedrons of 1/2 dimension, plus 4 equal fractions of the octahedral nucleus, revealing the edges of the cuboctahedron. The szasz solid is an irregular polyhedron with integer edges. 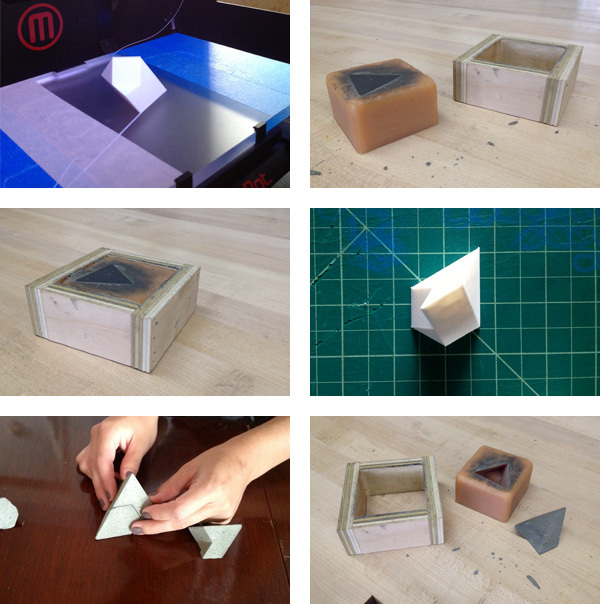 This solid was found during a RISD course taught by Merlin Szasz. The assignment consisted of building platonic polyhedra from sheet material, then stacking them. 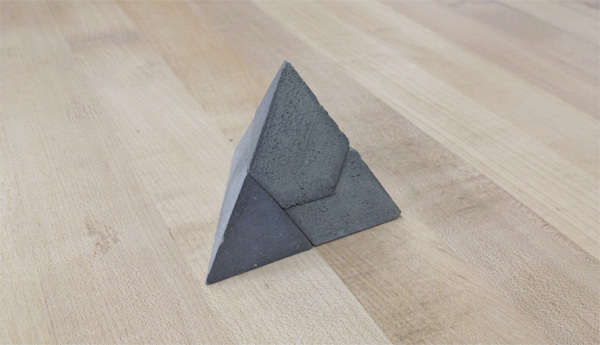 I explored the subdivision of regular tetrahedra and poured these small concrete models. 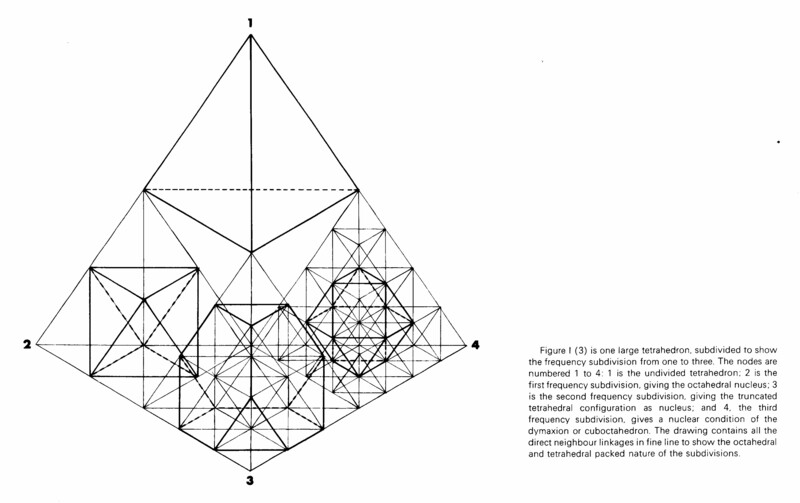 NOTES: A third frequency subdivision (ie. 2^3, or the edge of the large tetrahedron divded into 8) gives a nuclear condition of the cuboctahedron (aka the vector equilbrium, see #4). That cuboctahedron subdivides the nuclear octahedron from the first frequency subdivision. below image credit: Keith Critchlow's "Order in Space"
A. 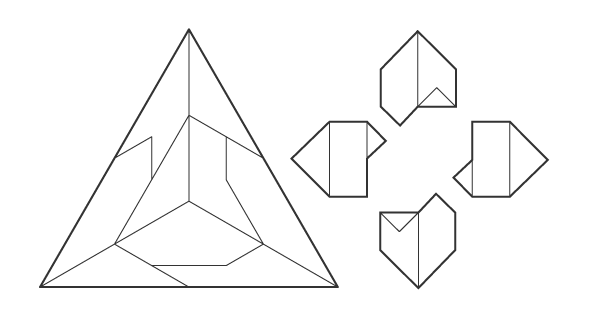 Initial tetrahedron at two-frequency stage. B. Tetrahedron is truncated: four regular corner tetra surround a central octa. The truncations are not produced by great-circle cleavages. C, D, and E show great-circle cleavages of the central octahedron. (For clarity, the four corner tetra are not shown.) Three successive great-circle cleavages of the tetrahedron are spun by the three axes connecting the midpoints of opposite pairs of the tetra's six edges. C. First great-circle cleavage produces two Half-Octa. D. Second great-circle cleavage produces a further subdivision into four irregular tetra called "Icebergs." E. Third great-circle cleavage produces the eight Eighth-Octahedra of the original octa. 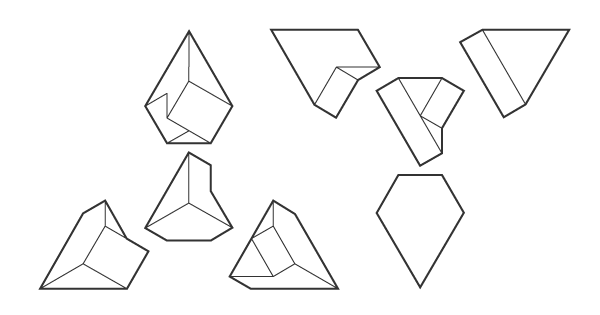 F. Eight Eighth-Octa and four corner tetras reassembled as initial tetrahedron.